One of my favorite ways to start a weekend is with a good cup of coffee. Two years ago, Ryan got me a Moka Espresso maker, which to his dismay, was my favorite gift that year (he had also gotten me some nice jewelry!). So needless to say, I take coffee very seriously. During the week, we make lattes with that same little Moka, but come Saturday morning, I want to go out. Usually, we go to Peets, because it’s close to our home in Coolidge Corner, but we’d been wanting to go to Kookoo cafe for some time now, and we finally went today. Kookoo was one of our regular haunts when Ryan lived in Brookline Village, but now that we’re in Coolidge Corner, we definitely don’t get there as much. It’s a shame too, because they have great pastries and even better coffee. The best part is that their bagels are from Iggy’s Bakery, and they’re chewy and crisp when toasted- not overgrown bread like other bagels in the Boston area. A very delish morning for Ryan and me. More Saturdays should start with a cafe au lait and multiseed bagel with cream cheese. Hey foodies. Jeez, this has been a crazy week- busy at work, and now a snow day. There hasn’t been much time left for cooking. Mondays are when Ryan has class, so I’m off the hook in the kitchen. There’s something very liberating about having one night where you can just make what’s easy and comforting. And for me- there’s nothing more comforting than a big bowl of pasta. My all time favorite pasta is white, with butter, salt, and pepper. Not a recipe for heart health, though tasty for sure. For Monday’s simple pasta, I just used a serving or so of Ronzoni’s Smart Taste pasta, which I like a lot. It reminds me of white pasta, but it’s higher in fiber and calcium, which I appreciate. I cooked it in salted water (delish- the secret to perfect pasta, but a little bit of a splurge for me! ), and topped with a little sage-infused olive oil. You know you’re a foodie when you have homeade sage infused oil laying around for purposes such as this. I garnished with a little salt, pepper, and fresh sage. For dessert, I had one of my new favorites from the grocery store- Wallaby Organic Yogurt. I’ve been really into greek yogurt lately, but Wallaby could change my allegiance to the Australian kind. It’s smooth and creamy, but in a way that’s totally natural, not like that nasty yoplait stuff. It’s sweeter than what I’d usually select for a yogurt, so I try to keep it to dessert time. I was a big fan of the bartlett pear flavor, and the “DownUnder Thunder” fruit on the bottom is great. The packaging is also really cool- clear plastic, so that you can see the delineation between yogurt and fruit. That’s all for now food nation. I’m exhausted, and it’s time to hit the sack! And go grab that Wallaby yogurt! For those of you in the Northeast, it’s on sale at Stop and Shop. I love football. I love the strategy of it, I love the energy of it, I love how every play is like art. Don’t tell me they’re just guys hitting each other- there’s so much more science to it than that! This isn’t a blog about football though, so you’ll have to check out CBS’s superbowl coverage for sports news. Even though the Patriots aren’t in the big game, I still need to celebrate a little- especially since this is the first year I’m cheering for an NFC team! So I decided to make my famous turkey chili. I’ve never written the recipe down in full, and I believe that a person’s chili is a deeply personal thing, so that the recipe is done completely to taste. Sometimes it works for me, sometimes it doesn’t. This one was a definite hit! 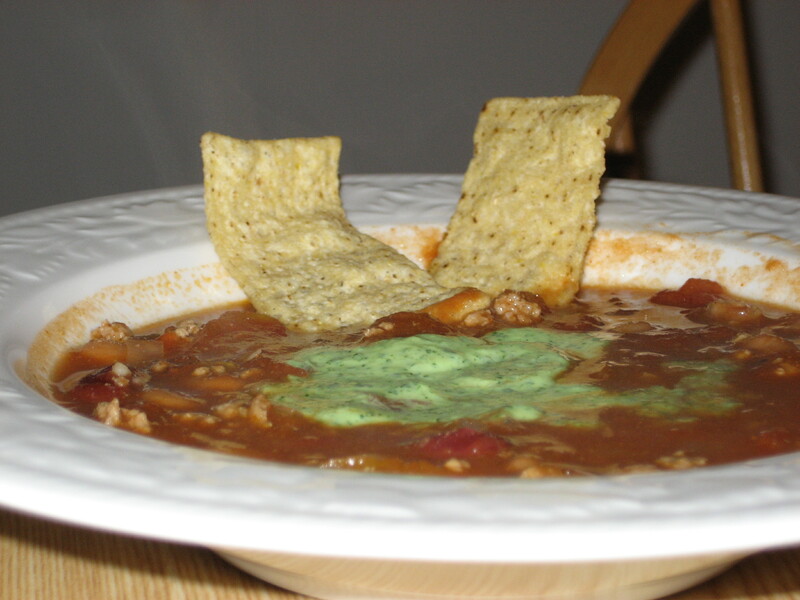 I’d been surfing the CookingLight website, and I came across a chili recipe that used beer as the liquid component in order to cut back on sodium. I thought it was an interesting concept, and decided to integrate it in my recipe. The other thing I tried this time was an Indian technique that I saw on Sara’s Weeknight Meals (Airs on PBS), which was blooming spices in oil. I think the combination was a welcome one, and although I omitted two of my usual ingredients in this batch (barbecue sauce and garlic powder), I’ve added them here, because I don’t think that the chili was the same without them. Add the spice mixture to the onions and garlic, sauté for a minute longer, then add the turkey meat to the pot, breaking apart the meat with the back of a spoon. Cook completely. Then add salt. Once the turkey is cooked, add the beer and cook for 3 minutes. Add the tomatoes and their juices, along with the beans and barbecue sauce. Serve on top of chili.